One gripe of my Gen2 Tuono has been the gear lever. Being direct acting, I've never been able to put it low enough to make the most of being able to upshift and downshift whilst keeping the foot on the peg. It can't help with quite large feet and even now with my lowed footage position, it's just not quite there. 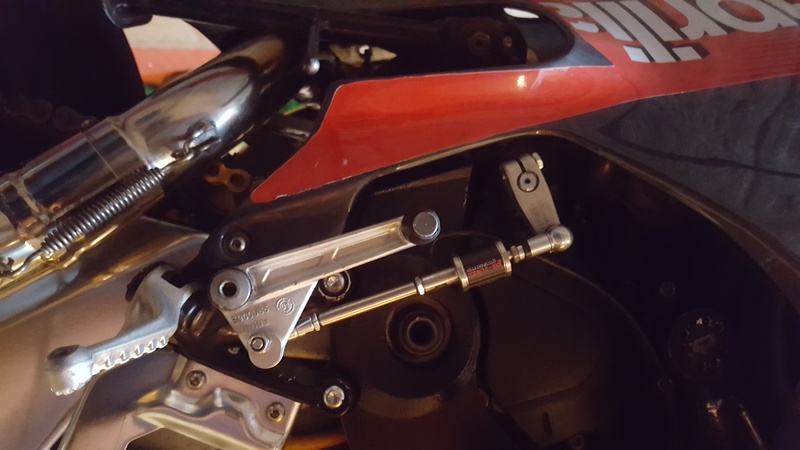 Having seen a YouTube video (link below) about another chap who made a GP shift system from a Ducati Monster lever and that the hole on the peg plate just in front of the peg position is for the Aprilia accessory GP shift system, cogs turned to make he have a go at making my own. A few weeks later, here we have a successful system! 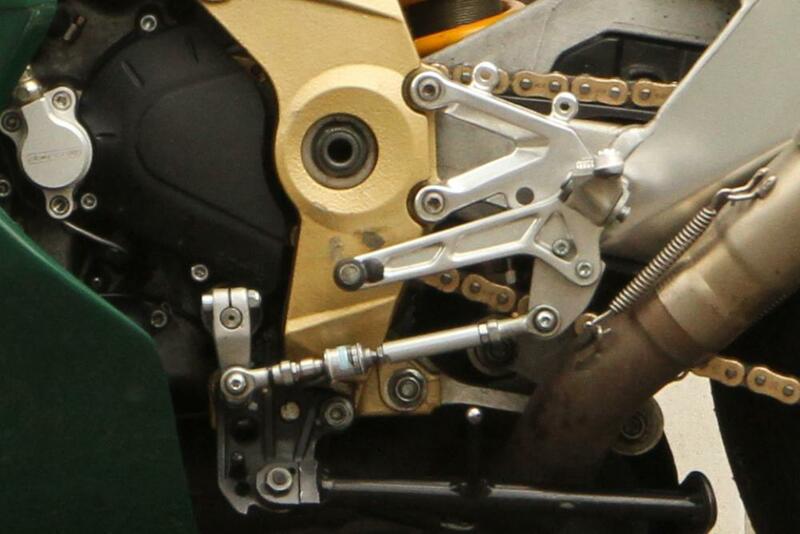 -Kawasaki ZZR600 mounting bolt for the gear lever. This was mainly because I got the ZZR lever to try and just reused the bolt. Any lever mount bolt for the bore size with a long enough thread will work. All in, about £45 in which would be under £40 if I only bought 1 lever rather than experimenting with 2. This setup plus a couple washers, nyloc nut and a spacer as I got a smaller 12mm mount bolt diameter and spaced it out to match the Suzuki 18mm bore. I will either replace this with a machined top hat spacer or a larger 18mm lever perch bolt and this will also reduce the need for more than 1 washer. There isn't a need for these exact levers, just need one that's designed to have the shift rod run behind it for packaging reasons. The Suzuki one has an angled rose joint mount that once I put the rose joint from the new shift rod on the other side, ran with no clearance issues. Yeah, deffo needs to go that way. At least with this system, dicking about can take place! As for your pic, it's upside down on the computer but right way up on mobile. Peculiar. Cheers. 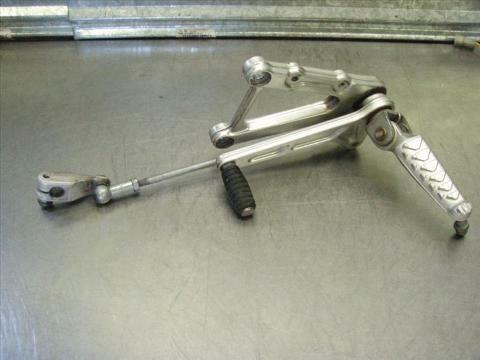 Yes, the RS125 lever did look good as did the Cagiva Mito lever, but both were either in bent conditions or much more pricy. I guess generic and common Suzuki and Kawasaki parts are much less in demand, hence why I got this new one for a tenner, winner. Update: I've now improved this system massively by getting a shorter shift arm to reduce the distance needed to shift and t increase the amount of force needed so you can feel it much better through a boot. Whist it is yet to look pretty (some minor extra work will sort that out), the cut and shut of this MT03 (320cc version) shift arm makes it much better. Either way, it looks like Yamaha bikes have the same gear shift shaft spline dimensions as Aprilia as I know of at least 2 other bikes that have a compatible shift arm. I choose this one to bodge as it was a boss with the splines and a bit of welded plate that I could easily cut off the old rose joint point and drill a new one. Easy! Yamaha r6 selector arm works great as well. It has a good off set. Aye it does and so did this MT03 one before cutting. A bit of heat and a vice will keep the offset and flatten the face of it to make it look pretty. That's the plan anyway! 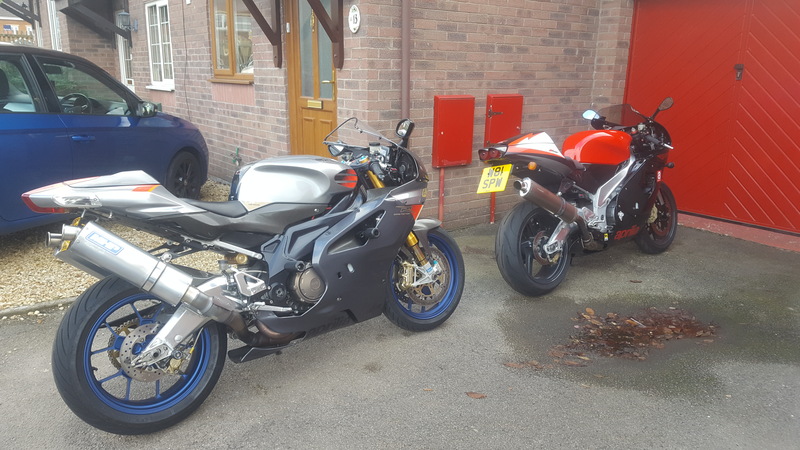 I wanted to convert to reverse shift - without the added expense of new rearsets. I cannibalised the bits from a Falco, which already has most of the required bits - The only change required was to file the footrest lugs of the RSVR footplate and bore it for the Falco through-bolt. 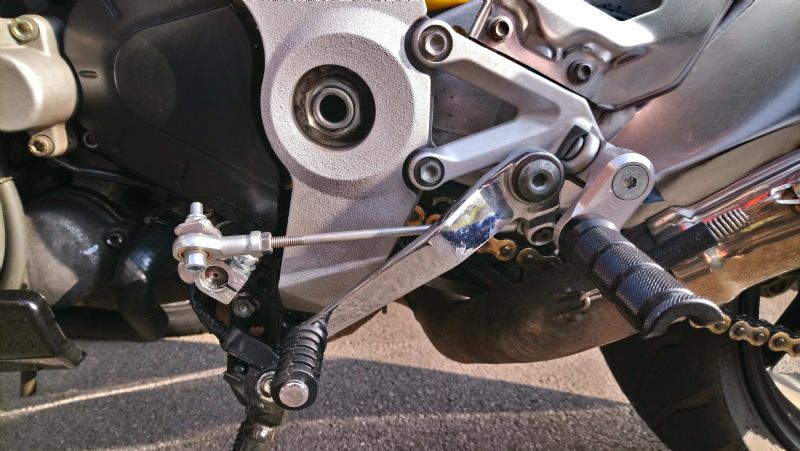 The picture shows the addition of a screwed-in plate to allow the quickshifter to clear the chassis and the shift arm shows a blanked hole from an earlier attempt to shorten the lever. IT WORKS. Yes, it is about a centimeter wider than standard, but there are only a couple of circuits in my portfolio where I'm heeled over on left-handers. Nice, looks slick. And unlike mine, it actually looks like it should be there! Perks of nicking Falco parts I guess.